All wannabe witches really need some decent flying lessons for Halloween to avoid unfortunate accidents. Get your own free, witch Halloween printable poster to hang up for the occasion. 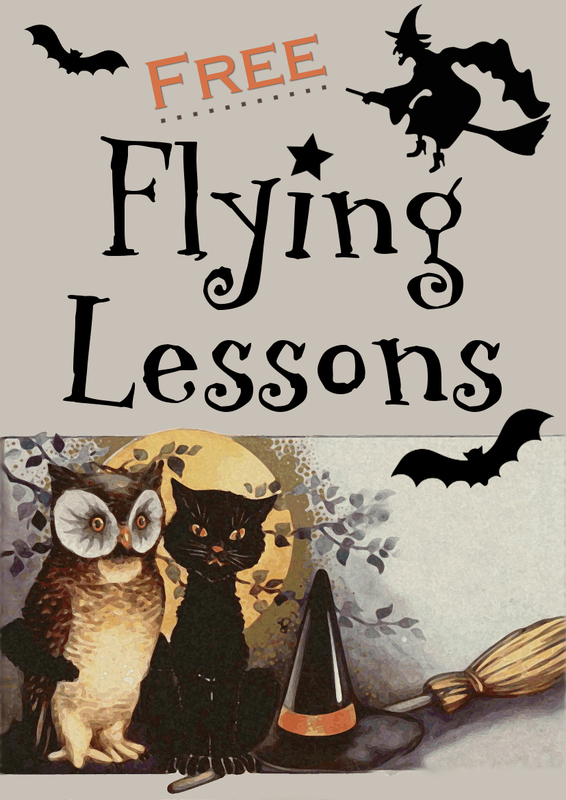 You'll find a short tutorial plus the Halloween free flying lessons witch printable freebie poster print on this page. Nothing to sign up for, just download, print and hang up this Fall season. This wall hanging would look good set next to a broomstick prop hung on the wall or placed on a door. It is the ideal design to use for some witch themed decor this Fall season. Download and print off your own Flying Lessons witch themed small poster print as a quick, last minute Halloween wall decoration. Print out your free Witch Flying Lessons Halloween design which is near the end of this page. I printed my design onto plain white paper, leaving a white border around the outside in order to have space to trim the design and mount up on to colored card. Printing on to smooth white card is best if you have it. Trim the design and choose a couple of card colors for mounting the print up. Trim the design up using scissors or a guillotine. Choose a couple of card colors for mounting the design on to. I used Bazzill Basics cardstock in black and orange. I love the texture you get on this Bazzill card. First mount up the print onto some black card. Mount up the design on to black card. I prefer to use double-sided tape for mounting prints but you can use glue such as a glue stick. Now mount the print onto the orange card for a nice Halloween style look. Mount the print onto orange card which makes for a nice and sturdy wall hanging. If you store this flat after Halloween, you can re-use the design next year as well. Punch holes in the top of the design for hanging it up. If you want to hang this poster print up, punch a couple of holes near the top so you can thread cord or twine through. Alternatively, you can use blu tack to stick this flat to the wall or a flat surface such as a door. You can add on your own detail with glitter and craft accessories such as ribbon bows. Make the design your own by adding on your own choice of detail. I added some glitter detail using Stickles glitter glue which you can see along the witch's broomstick. I also added in a star and a ribbon bow to the witch hat. Enjoy your free printable for Halloween!